This entry was posted on Thursday, September 11th, 2014 by Frances Ryan. This guest post was written by Anthony Heard, ITP patient and volunteer, as part of my ITP Awareness Month Iceless Challenge. If you want to share your own ITP story (or a poem or drawing? ), please contact me. My ITP adventures started on Friday, July 28th, 2006, and my life changed dramatically from that day. Probably like many other ITP sufferers, I had never before had any serious illness. The diagnosis of ITP (idiopathic thrombocytopenic purpura) was a complete shock. For ages I could not correctly pronounce it let alone understand what it was—but looking back I had probably been suffering from it for about a year before diagnosis. I had ignored mysterious bruises that I had been getting on my arms, legs, and torso because I had no idea that they were anything serious. I visited my GP (general practitioner) because I had been feeling very run down, but on seeing bruises on my arms and legs my GP insisted I have an immediate blood test which confirmed my platelet count was 4, against a normal level of 150 to 400*. I was ordered to report directly to the Royal Berkshire Hospital. ITP was diagnosed after four hours of tests and I was prescribed 100mg of the steroid prednisolone and 20mg of omeprazole (to mitigate some of the side effects of the steroid). I was told about the possible side effects of steroids but nothing prepared me for just how sleepless the nights would be, how hungry I would always be, how much weight I would gain, and how my moods would swing more than Count Basie. Within a week my platelet count climbed to 75, so I was kept on a reducing steroid dosage for three months. I continued with normal full-time work and family life. Having just started my Open University (OU) BA degree, studying diverted my attention from the unpleasant side effects of my treatment; it filled the wee small hours of steroid-induced sleepless nights. My positive response to steroids saw me taken off them by November 2006, but in February 2007 my platelet levels nosedived so I was prescribed steroids again. My system responded well but four months after withdrawal of the steroid my platelets collapsed again. This pattern was repeated in 2008 and 2009, so in June 2010 my specialist agreed that we had to break the steroid cycle and he prescribed rituximab treatment. The four treatments lasted about six hours each and were delivered intravenously. The treatment worked and my platelet count stayed over 120 until April 2013. I did not need any medication from August 2010 until April 2013 when my counts started to fall again and my remission period came to a crashing halt. But I was given another round of rituximab treatment in April 2013 which has put me back into remission since then, thank goodness. During my eight years with ITP, I have completed the OU Certificate in Humanities, my BA Open degree, and am half-way through achieving the Certificate of Higher Education in Social Sciences. You could say that I have been bitten by the OU bug!! Additionally, I am now doing voluntary work with the ITP Support Association as I want to help others who suffer from this mysterious, baffling illness. My thanks go to the wonderful staff at the Royal Berkshire Hospital (especially West Ward and Dr Sadon Hassan) and the ITP Support Association. Also to my fantastic OU tutors over the last 5 years, thank you for your encouragement and support. My name is Anthony Heard. 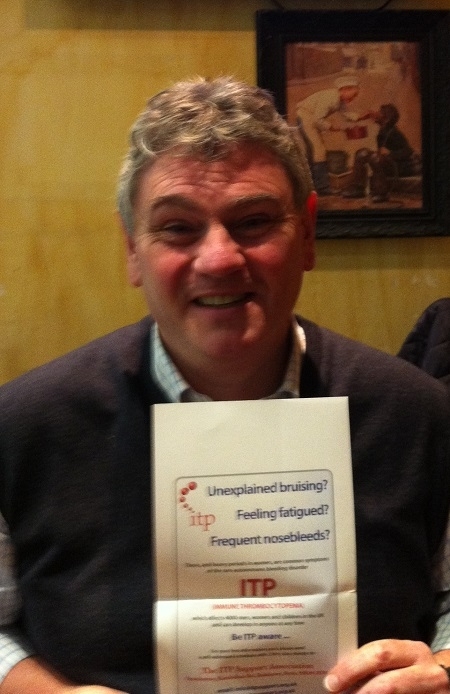 I am 54 years old and I am ITP positive! * Note from Just Frances: A normal platelet count is 150-400 x 109/L which equates to 150,000-400,000. However, the counts are generally quoted without the extra zeros. Hence, a count of 50,000 is referred to as 50.